This article is about Charizard's appearance in Super Smash Bros. Ultimate. For other uses, see Charizard. Also, for information about Charizard in regards to Pokémon Trainer, see Pokémon Trainer (SSBU), Squirtle (SSBU), and Ivysaur (SSBU). Charizard is a character in Super Smash Bros. Ultimate. Unlike in Super Smash Bros. 4, Charizard is no longer a standalone character, and is back under the Pokémon Trainer’s control. It was confirmed on June 12th, 2018. Along with the Pokémon Trainer, Charizard is classified as fighter #35. Shin'ichirō Miki reprises his role as the Pokémon, providing new clips once again. Charizard deviates from the other super heavyweight characters in speed. Its ground game provides wide utility courtesy of its high initial dash and run speed. Also, its normals such as forward tilt and jab are further supplemented by skid canceling. Its high traction and quick out-of-shield options like neutral attack and up smash suit its close-quarters combat well. Up smash hits on frame 6, KOs at reliable percents, and functions as an effective juggling and anti-air tool alongside up tilt. Neutral air is a multi-purpose tool effective at starting and extending combos, juggling, edgeguarding opponents, and sometimes landing. It is capable of stringing into itself, forward air, and down air. Forward air is fast (frame 8) and deals considerable damage to finish combos and KO at high percents. However, it does not autocancel out of a short hop, so it is only a mix-up at best in the neutral game. Up air renders Charizard's head intangible and is one of the strongest in the game, making it an effective juggling tool and finisher. It is also a makeshift combo too at low to middle percent ranges. Back air is extremely powerful and disjointed; it covers a wide diagonal arc behind Charizard and overpowers opponents above it. Down air’s sweetspot hitbox is large and powerful, enabling it to seal stocks at low percents. Charizard’s grab game sees high flexibility, being capable of setting up into combos and positioning the opponent, as well as earning KOs. Having minimal ending lag, back throw is a versatile combo tool and positions the opponent off-stage at higher percents as well. Down throw fills the combo starter niche as well, although to a lesser extent than back throw. Forward throw has higher knockback than back throw, being able to set up edgeguards and ledge traps earlier, as well as KO’ing at higher percents. Up throw functions as a last-resort KO option at 150% and above, or earlier on stages with platforms. Of Charizard’s special moves, Flamethrower sees the most utility, having medium range and flexibility in being angled. It pressures opponents to approach, covers certain weak projectiles, and is a useful ledge-trapping move. Fly has super armor at its startup, granting Charizard’s recovery more safety. Flare Blitz functions as a hard punish or tech chase option that deals immense power and knockback upon hit. Charizard’s main benefits include its strong advantage state, damage-racking capabilities, and KO potential. It is able to build high damage from only a few hits thanks to its high damage output in its combos and strings, particularly out of back throw. Charizard is the most advantaged when it is below the opponent. Its neutral air, up tilt, up smash, and back air are disjointed and cover wide arcs against opponents above it. Charizard also comes with respectable edgeguarding and ledge-trapping abilities. Flamethrower covers many get-up options when properly spaced, and the player is able to punish them on reaction thanks to down smash, up smash, and neutral air. Downwards forward tilt and down smash are also capable of two-framing the ledge. Charizard's weaknesses include its raw moveset causing it to have a mediocre neutral game. Flamethrower’s decay prevents it from being usable for a long time, and its few safe-on-shield options, such as back air and forward tilt, require precise spacing and positioning at their optimal execution. Charizard's moveset also contains several critical flaws that arguably neutralize its strengths, including forward air not being able to autocancel out of a shorthop and jab not linking consistently at anywhere farther than point-blank. Thus, its moveset requires high commitment, resulting in heavy reliance on telegraphed reads to secure advantage state. In addition, it has few options in the disadvantage state, outside of neutral air and an extra mid-air jump. Overall, Charizard is a well-rounded super heavyweight but has the weakest auto-pilot of the three Pokémon in the Pokémon Trainer’s party. It must rely on sheer mobility and player interaction, as well as working around the glaring problems its moveset contains. Charizard is able to function both offensively and defensively in the neutral, but it is up to the player to find the most beneficial position in this spectrum. Once it gains advantage, it must capitalize on the opponent’s mistakes to the greatest extent for the highest return. Previously the standalone character in Smash 4 representing the trio of Pokémon in Brawl, Charizard now returns as part of the Pokémon Trainer's crew. As expected, it keeps many of its changes and buffs from Smash 4, retaining its function as the hardest-hitting member of the Trainer's party while also gaining new, significant buffs to its mobility. Having been considered a lackluster character in Brawl and in early SSB4, Charizard has received a mix of buffs and nerfs, but the former are more prominent as they address its more critical flaws in the previous game. Its overall mobility has been substantially improved; its previously abysmal initial dash speed is now one of the fastest in the game, its second midair jump covers more height, and its air speed is now substantially faster compared to in Smash 4. Its falling speed and fast falling speed are much higher, making it easier for it to land while making its neutral game more effective, and the universal frame 3 jumpsquat significantly helps its buffed aerials (which are now faster). Up tilt's hitbox covers more horizontal range, up smash can now hit grounded opponents, and Flare Blitz and Fly have had their power and hitboxes buffed respectively, making Charizard's moveset more reliable. Neutral air's endlag has been drastically reduced and its animation has been made faster, repurposing it into an effective air-to-air option and combo extender. Charizard's nerfs include a weakening of its former most effective tools, including its neutral attack's reliability, down throw's mitigated combo ability from its higher ending lag, and forward aerial no longer autocanceling in a short hop. Its higher fall speed also makes it easier to combo. However, Charizard's most notable loss comes from the removal of Rock Smash to make way for Pokémon Change, eliminating a niche landing option and shield-pressuring tool from its moveset, with the only compensation being if the player wishes to make full use of Pokémon Change to take advantage of Squirtle's attributes. In terms of execution, Charizard functions differently from in Smash 4 because of the overall changes to its moveset and different engine, but it generally serves the same purpose as a lightning bruiser. It is fundamentally better but is counterbalanced by gaping holes in its kit such as forward aerial not autocanceling from a short hop. As such, Charizard is worse relative to the cast compared to its solo appearance in SSB4, but as a member of Pokémon Trainer's team, it is more useful because it allows the Trainer to adapt to situations where its recovery, endurance and KO power are needed and can replace itself with Squirtle or Ivysaur in cases where its weaknesses can be exploited. Charizard's model features a more subdued color scheme, resembling its appearance in recent mainline Pokémon games. Additionally, its legs and arms are more prominently muscular, the flame on its tail is also more vibrant. During normal matches, Charizard uses the Pokémon Trainer's stock icon and name call instead of having its own. However, its own stock icon is seen in the Spirits mode, as both a playable character and an enemy. Charizard now hangs onto the ledge with one hand instead of two. Charizard has two new taunts: one where it stands upright for its up taunt, similar to Ridley's down taunt, and another where it does a quick aerial flip and roars during its side taunt. Its former up taunt is now its down taunt. 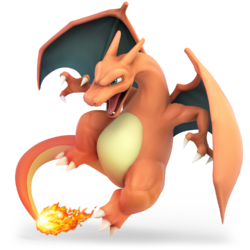 While maintaining its Flare Blitz victory pose from Smash 4, Charizard regains its victory pose from Brawl where the Pokémon Trainer pets its neck, replacing the roaring victory pose from Smash 4. Charizard is once again a part of Pokémon Trainer, allowing it to switch to Squirtle and Ivysaur. Like all characters, Charizard's jumpsquat animation now takes 3 frames to complete (down from 7). Charizard walks slightly slower (1.2 → 1.187). Charizard's initial dash speed is exponentially higher (1 → 2.28), going from the slowest in the game to the 4th fastest. Charizard runs faster (2 → 2.2). Charizard's air speed is much faster (0.92 → 1.103). Charizard has significantly higher traction (0.04 → 0.11), no longer being tied with Mewtwo for the second lowest in the game. This allows it to punish out of shield much more easily. Charizard moves its head to a less vulnerable position during forward air, down smash, standing grab, and when hanging on the ledge. Charizard's second midair jump now gives as much height as its first, improving its air game and recovery. Charizard's falling speed and fast falling speed are much faster (1.4 → 1.52) and (2.24 → 2.432) respectively. This makes it more prone to combos, but improves its tomahawk and overall neutral game. Charizard takes small amounts of damage while swimming. It shares this attribute with Sonic, Inkling, and Incineroar. Forward roll grants less intangibility (frames 4-18 → 4-16). Back roll has more startup with less intangibility (frames 4-18 → 5-17), and more ending lag (FAF 33 → 38). Spot dodge has more ending lag (FAF 28 → 29). Air dodge has significantly more ending lag (FAF 34 → 50). The first hit transitions into the second hit faster (frame 10 → 7), which transitions into the third hit faster (frame 10 → 8), allowing them to connect better. The first and second hits deal less damage (3% → 2.5% (hit 1), 4% → 2.5% (hit 2)). The first and second hits have altered angles and knockback to keep opponents close to Charizard, akin to other neutral attacks. This allows them to connect and jab lock better, but removes their jab cancel setups. Forward tilt contains a new sweetspot hitbox on frame 12 that is centered in front of Charizard's tail, with the original sweetspot remaining intact. This prohibits issues with the z-axis. Forward tilt has less ending lag (FAF 43 → 38). Forward tilt has more startup lag with a shorter duration (frames 11-13 → 12-13). Up tilt has an altered animation with Charizard jumping higher and its wings spreading out more to its sides. This increases the move's horizontal range. It launches opponents slightly away from Charizard instead of towards it, worsening the move's ability to combo into itself at low percents. Up tilt has a shorter duration (frames 9-13 → 9-12). It deals much less knockback, no longer being able to KO grounded opponents under 200%. This improves its combo potential when coupled with Charizard's faster jumpsquat, but hinders its KO potential. Forward smash grants more intangibility (frames 22-25 → 20-24). Up smash's second hit comes out faster (frame 17 → 14), allowing it to connect better from the first hit, and giving the move faster interruptibility as a result (FAF 49 → 47). The outermost hitbox on the first hit now drags opponents into the second hit instead of weakly meteor smashing them in place, enabling it to connect more efficiently. Neutral aerial has faster startup (frame 9 → 8) and significantly less ending lag (FAF 60 → 40), making it safer to use offstage. Its animation has been sped up. This reduces the duration of its hitboxes (frames 9-25 → 8-19), but allows it to hit faster around Charizard. Due to its autocancel window remaining unchanged, this effectively increases the move's ending lag before it can autocancel. Forward aerial has one frame less ending lag (FAF 47 → 46). It no longer autocancels in a short hop, as Charizard's faster falling speed causes its autocancel to fall short by one frame. Back aerial has increased vertical range. This enables it to punish opponents recovering from above more reliably. Up aerial auto-cancels earlier (frame 41 → 38). Down aerial's lower landing lag alongside the removal of teching for grounded meteor smashes enable it to function as a potent combo starter onstage. The sweetspot also has a longer duration (frames 18-20 → 18-21). The clean hit has received a sourspot on Charizard's body that does not meteor smash, making it slightly harder to use for edgeguarding. The late hit also has a shorter duration (frames 21-26 → 22-25). It auto-cancels later (frame 41 → 42). It's initial auto-cancel window has been lengthened (frames 1-4 → 1-5). All grabs have more ending lag (FAF 34 → 40 (standing), 42 → 46 (dash), 40 → 43 (pivot)). Dash and pivot grab have more startup (frame 10 → 11 (dash), 11 → 12 (pivot)). Pummel deals less damage (2% → 1.6%). Back throw releases opponents faster (frame 29 → 26), though with its interruptibility frames unchanged. This makes it harder to DI, but gives it more ending lag. Despite this change, it has increased combo ability due to Charizard's much faster initial dash speed and jumpsquat. Up throw deals slightly less knockback. Down throw deals less hitlag, allowing it to execute faster. It has slightly more ending lag (19 → 22 frames). Despite this change, it has increased combo potential due to Charizard's faster jumpsquat. Down throw deals less knockback, allowing it to combo for longer. It has an altered animation where Charizard hovers slightly while breathing fire onto the opponent. Flamethrower is more vibrant in color as opposed to the more realistic flame in Smash 4. Flare Blitz deals drastically more damage (4% → 6% (hit 1), 15% → 18% (hit 2); 19% → 24% (total)). It deals more knockback, KOing middleweights under 80% from the center of Final Destination. The tumble animation following Flare Blitz's collision cannot be jab locked. It no longer snaps to the ledge until Charizard is in the move's final frames. Flare Blitz causes Charizard to emit orange flames on startup instead of a glowing blue. Its flame effects are much more intense. Charizard's voice is now louder when using the move, allowing players to hear it without adjusting the Sound settings. Due to rage being changed to not affect hitboxes with set knockback, Fly no longer launches opponents away from the rest of the hits when Charizard has rage, allowing it to connect more reliably. As a result of rejoining the Pokémon Trainer's team, Rock Smash has been replaced with Pokémon Change. While this reduces Charizard's own defensive capabilities, it allows it to instead change places with Squirtle and Ivysaur to adapt to different situations. Pokémon Change is much faster due to no longer having to load the next Pokémon during every switch, and it can now be used in the air. Like in Brawl, it also offers brief intangibility upon switching out, though the quicker switch time allows it to potentially combo into another Pokémon's moves, or function somewhat as an alternative to a dodge. It also allows the user to choose the recovery that suits a situation best. Spamming Pokémon Change will grant no invincibility frames for a period of time. It also has a cooldown of 140 frames (2.33 seconds), though it can be skipped by using a special move. The removal of Rock Smash hinders Charizard's landing options and eliminates one of its KO moves. Charizard's previous Final Smash, Mega Charizard X, has been reverted to Triple Finish. Triple Finish has an updated animation, and its textbox closely resembles the textboxes in the Generation VII Pokémon games. Charizard now fires five Fire Blasts in a row. Down aerial's landing animation no longer causes Charizard's tongue to clip through its head. Grounded Flare Blitz can more easily hit enemies below it. Charizard can perform two midair jumps. Charizard takes continuous damage when swimming. It shares this with Incineroar, Sonic, and Inkling. 2.5% Two alternating slashes with its claws, followed by swinging one of its wings upward. Thanks to its impressive damage output for a neutral attack, minimal startup lag, and deceptively long range, it is reliable for damage racking at close range. 11% (flame), 7% (tail) Swings its tail forward. It can be angled, has long range, and its sweetspot is at the flaming tip of Charizard's tail. When sweetspotted, it has high knockback for a tilt attack, KOing middleweights at around 140% from the center of Final Destination. Wing Thrust 8% Jumps with its wings widespread, hitting with them above itself. Thanks to its long vertical range and Charizard not possessing hurtboxes in its wings, it is an effective anti-air attack. Its relatively low knockback and ending lag also allow it to combo into itself at low percents, and into aerial attacks up to high percents. However, it has short horizontal range, being unable to hit opponents on the ground unless they are right next to Charizard. 10% A battering ram. It has deceptively long range and launches at a semi-spike angle, which makes very useful for edgeguarding. However, despite dealing decent damage, its knockback is below average, making it unsuited for KOing unless the opponent is close to the edge. 13% (clean), 10% (late) A front kick. It has very high base knockback, and its range and long duration make it decent at punishing and zone breaking. 17% (clean, late body), 14% (late head) Rears back its head and then performs a lunging headbutt. It is very strong, with its sweetspots KOing middleweights under 85% from the center of Final Destination. It also renders Charizard intangible throughout its duration. Due to it hitting on frame 22 and having 45 frames of ending lag, however, it is very punishable. 5% (hit 1), 11% (hit 2) Rears back and swings its wings upward twice in an overhead fanning motion. It has the lowest startup and ending lag out of Charizard's smash attacks, and is one of the fastest smash attacks as a whole in terms of startup. Thanks to its long vertical range and Charizard's wings lacking hurtboxes, it is also a very useful anti-air attack. On the other hand, it is Charizard's weakest smash attack, although still strong enough to KO reliably. 16% Stomps the ground to cause a small earthquake. It simultaneously hits in front of and behind Charizard, dealing high damage and knockback. Its sweetspots also launch at a semi-spike angle, making them deadly for edgeguarding and KOing near edges. However, it is very punishable due to its slow startup and extremely high ending lag. 12% (flame), 9% (tail) Somersaults forward to strike with its tail. Like forward tilt, its sweetspot is at the flaming tip of Charizard's tail. It can autocancel in a short hop, and quickly hits all around Charizard. This make it a fairly safe landing option and useful combo starter when autocanceled, with followups including neutral attack, dash attack and forward aerial. However, it deals below average knockback even when sweetspotted, so it is unsuited for KOing. 12% (early), 13% (clean) A downward arcing slash with its claws. It is tied with neutral aerial for the fastest startup out of Charizard's aerials. Its high damage, knockback, and semi-spike angle make it reliable as an edgeguarding and KOing option, and as a followup from down throw. However, it has high landing lag compared to other aerials, and cannot autocancel in a short hop, making it unsafe for approaching. Aerial Tail 16% (flame), 14% (tail), 11% (body) Swings its tail backward. Like forward tilt, its sweetspot is at the flaming tip of Charizard's tail. It has slow startup, ending lag and landing lag, but when sweetspotted, it is one of Charizard's strongest moves, dealing high damage and KOing middleweights under 100%. Due to its high damage output and long range, it is also safe on shield when spaced properly. 13% An upward headbutt. Its respectable damage output and high knockback allow it to KO middleweights under 100% near the upper blast line, making it a formidable KO option. It also renders Charizard's head intangible throughout its duration, and is tied with its neutral aerial for having the lowest amount of landing lag out of its aerials. However, it has minimal horizontal range. 14% (clean), 8% (late) Stomp downward with one leg. The clean hit is a meteor smash if Charizard's leg connects, while otherwise dealing strong horizontal knockback with its body. It has the highest overall lag out of Charizard's aerials, but can function as a combo starter against grounded opponents, leading to an up tilt or up smash at low to mid percents, and aerial attacks up to high percents, even allowing for a potential KO setup with an up aerial. — Clinches the opponent. Charizard's grab range is above average. 1.6% A bite. Slow but highly damaging compared to other pummels. 10% Sways its head with the opponent in tow and then flings them forward. It deals respectable damage and can be used to set up an edgeguard. It also has respectable KO power for a throw, KOing middleweights near the edge of Final Destination at around 145% without rage, and can be used for a DI mixup, as the optimal DI for this throw is poor for up throw (which can also KO) and vice versa. 10% Flings the opponent backward. It deals respectable damage and can be used to set up an edgeguard. Unlike forward throw, it has very low ending lag. As a result, it can combo into dash attack at very low percents, and a forward aerial or back aerial up to mid percents. It can also be followed up by Flare Blitz, though this requires successfully reading the opponent's action out of hitstun. 8% (hit 1), 3% (throw) Soars to the upper blast line with the opponent in tow, then dive-bombs them onto the stage at a blinding speed, similarly to Kirby and Meta Knight's up throws. It is one of the strongest throws in the game, KOing middleweights at around 130%, or even earlier if Charizard lands on a platform closer to the upper blast line. Due to leaving Charizard in the air next to the opponent after throwing them, it can also combo into a forward aerial at low to mid percents if the opponent does not DI away. However, its mostly vertical, yet more horizontal angle than other up throws allows for the victim to apply both optimal DI and LSI against the move, drastically weakening it to the point middleweights can survive it up to around 160% if Charizard has no rage. 1% (hits 1-5), 1% (throw) Pins the opponent to the ground and hovers above them to expels embers from its mouth onto them. Its moderate ending lag allows it to function as a reliable combo starter, leading into a dashing up smash at low percents, and a neutral or forward aerial up to mid percents. 7% Swings its tail backward, then headbutts forward while getting up. 7% Swings its tail forward and backward while getting up. 5% Performs a slash with its claws while getting up. 10% Performs a battering ram while climbing up. This comes out on frame 24, compared to Squirtle's slow frame 28 and Ivysaur's quicker frame 21. Flamethrower 2% (clean), 1% (late) Expels a stream of flames from its mouth, almost identically to Fire Breath. Like Fire Breath, it can be angled, which makes it useful for gimping low recoveries. Compared to Fire Breath, Flamethrower is better at damage racking and spacing, thanks to its overall higher damage output and its farthest hitboxes being able to cause flinching. Like Fire Breath, however, it has considerable startup and ending lag, while its power and range also gradually decrease when it is used for more than a few seconds. Flare Blitz 6% (collision), 18% (explosion) A flaming, corkscrew tackle. It is very powerful, dealing the highest base damage out of Charizard's attacks, and KOing middleweights under 80% from the center of Final Destination. In addition to its offensive potential, it covers an impressive amount of horizontal distance and grants armor on frames 23-53 that can withstand a maximum of 15%, allowing it to extend Charizard's recovery and plow through opposing attacks. However, it is very risky to use outside of punishes, as it deals 5% recoil damage both at its beginning and on contact, and is very unsafe on shield because of its extreme amount of overall lag and how it forces Charizard into a tumble that cannot be teched. When used unwisely, its impressive horizontal distance can also result in an inadvertent self-destruct when used near an edge. Fly 5% (hit 1), 2% (hits 2-5), 4% (hit 6) Flies upward while corkscrewing. It can be angled and covers a relatively average amount of vertical distance. Due to it hitting on frame 9, it has the lowest amount of startup out of Charizard's special moves. When coupled with it granting super armor on frames 4-15, this enables it to function as an effective combo breaker and out of shield option. It also deals respectable damage when all of its hits connect, and can KO reliably at high percents. Pokémon Change — The Pokémon Trainer calls Charizard back to its Poké Ball, and sends out Squirtle. Triple Finish 5% (Fire Blast, first four), 12.5% (Fire Blast, final), ~50% total The Pokémon Trainer sends out both Squirtle and Ivysaur, and all three Pokémon perform a combination attack involving powerful trapping attacks with long horizontal range. For Charizard's contribution to the attack, it uses Fire Blast, expelling five star-shaped blasts of fire that travel a long distance forward, with the last one having the highest power. Pokémon Trainer releases Charizard from its Poké Ball while saying "Go!" or "Charizard!" Charizard quickly stomps once as it emerges. Up taunt: Stands upright and spreads its wings. Side taunt: Quickly performs a full turn in midair, then stomps on the ground and roars. Down taunt: Turns towards the screen and lowers its head, then roars to the sky, creating a shockwave. Raises its foot as it leans back, opening its mouth as if roaring, and then stomps its foot. Turns its head to the side and quickly spits fire towards the ground. During Charizard's victory poses, the Pokémon Trainer will say one of two lines at random. The male Trainer will say either "You all did great!" (みんな、よくがんばったな！, Everyone, you did great!) or "You did it, Charizard!" (やったぞ、リザードン！, You did it, Charizard!). The female Trainer will say either "Everyone did great!" (みんな、最高だね！, Everyone, you're the best!) or "You're amazing, Charizard!" (すごいね、リザードン！, Amazing, Charizard!). Pokémon Trainer pets its head and neck. During the opening cutscene, Charizard was sent out by Pokémon Trainer, along with Squirtle and Ivysaur, shortly before Galeem unleashed his beams of light. Under Pokémon Trainer's command, Charizard used Flamethrower in an attempt to fight the beams of light, but this attempt failed. Pokémon Trainer, Squirtle, Ivysaur and Charizard were all vaporized and placed under Galeem's imprisonment along with the other fighters, excluding Kirby. Charizard's Fighter Spirit can be obtained by completing Classic Mode. It is also available periodically for purchase in the shop for 500 coins. Unlocking Charizard in World of Light allows the player to preview the first spirit below in the Spirit List under the name "???". As a Fighter Spirit, it cannot be used in Spirit Battles and is purely aesthetic. Each Fighter Spirit has an alternate version that replaces them with their artwork in Ultimate. Additionally, one of Charizard's Mega Evolved forms appears as a Primary Spirit. Charizard in Pokémon Trainer's fighter card. Charizard performing Flare Blitz on Prism Tower. With Squirtle, Ivysaur, and a Burrowing Snagret on The Great Cave Offensive. Taunting with Squirtle and Ivysaur on Skyworld. Charizard is the only character in Smash Bros. to have been part of a transformation character in one game, separated into a standalone character, and then reverted back to a transformation character. The official Pokémon website claims that this was due to a stint of disobedience, similarly to Ash's Charizard. This is hinted at via its new taunts and "hugging" victory pose, in which it appears to be more prideful and happy (behaving like a domestic animal) and less feral and savage. Charizard and Lucario are the only characters to have had their Final Smash change between games only to have it revert back to the previous Final Smash. In Charizard's case, it had Triple Finish in Brawl, changed to Mega Charizard X in Smash 4, and then reverted back to Triple Finish in Ultimate. Because of this, Charizard is the only playable Pokémon capable of Mega Evolution that does not Mega Evolve for their Final Smash; however, Mega Charizard X reappears in Spirit form. Unlike in Brawl, the number of Fire Blasts fired by Charizard during Triple Finish matches the amount of PP that Fire Blast has in the mainline Pokémon games. Charizard's amiibo is the only amiibo in Pokémon Trainer's group that predates the Super Smash Bros. Ultimate line. Charizard is the only veteran from Smash 4 whose character select screen voice clip is not reused in Ultimate, as the character select screen and victory screen uses Pokémon Trainer's name instead. This page was last edited on April 20, 2019, at 17:24.